To borrow a line from Maxine Nightingale’s catchy 1970s pop hit, hockey fans in Johnstown, Pa., are right back where they started from. The song that was featured in the iconic 1977 hockey movie “Slap Shot,” which was filmed in Johnstown, has long been the theme song for residents in the small Pennsylvania city, located about 70 miles east of Pittsburgh. That’s because hockey is back in Johnstown with the debut of the Tomahawks, a North American Hockey League Junior A team. The sport has a rich tradition in Johnstown as the city has played host to many minor professional squads throughout the past six decades. Also, it spawned the classic hockey film, which starred Paul Newman and was based on the 1974-75 Johnstown Jets season. Even with its proud hockey heritage, the city found itself without any high-level hockey when the ECHL’s Johnstown Chiefs moved to Greenville, S.C., in 2010 after a 22-year run in the city. The move stunned the hockey community in the area, especially Rick Boyd, a former Chiefs star player and assistant coach. “I sat there during the last Chiefs game and The proud hockey town made famous in the movie Slap Shot rejoices at the return of the game.reflected. If it wasn’t for the Chiefs, I wouldn’t have met the woman I married or have the kids I have,” said Boyd, now the Tomahawks’ general manager and director of hockey operations. 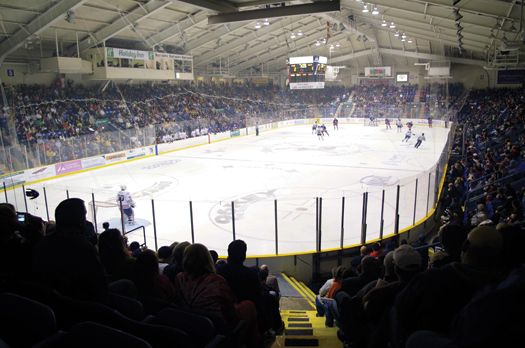 The ECHL’s Wheeling Nailers played 10 games at Johnstown’s Cambria County War Memorial Arena in 2011 and 2012, but Johnstown’s fans craved their own team. That's when an ownership group, featuring minority owners and former NFL players Jack Ham and Shane Conlan, purchased the NAHL’s Alaska Avalanche, relocated the team to Johnstown and rebranded them as the Tomahawks. The only question was, would Johnstown fans embrace a Junior hockey team after watching decades of professional hockey? Tomahawks head coach Jason Spence, who spent seven seasons as a player and another as an assistant coach for the Chiefs, just wanted a chance to convince them. “There was a lot of curiosity. There have been a lot of people who watched the Chiefs and Jets and the teams who were here for years. Now, the players are 20 years old and under. It’s different and there was skepticism,” Spence said. “I talk to a lot of these people, and I know a lot of them on a personal basis. I just told them they have to come see one game and they’ll be hooked. 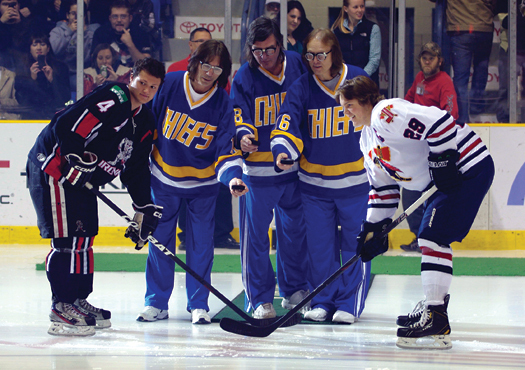 A packed house of loyal fans and some special guests, the Hanson Brothers, helped the Johnstown Tomahawks of the North American Hockey League usher in a new era of hockey in western Pennsylvania. While the Tomahawks may not be the rough and tumble Jets and Chiefs teams of the past or “put on the foil” like the movie’s Hanson Brothers, they play a physical game, but can rack up goals as well. Dave Hanson played two full seasons for the Johnstown Jets in the 1970s and gained fame as one of the Hanson Brothers characters for the fictional Charlestown Chiefs in “Slap Shot.” He got to see the new team in action when he and the other two Hanson Brothers characters, Jack and Steve Carlson, made a December appearance at a Tomahawks game and reprised their roles in front of a raucous crowd. 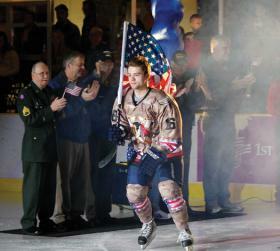 “There are a lot of people who don’t know really how deep the hockey tradition is in Johnstown. It’s just incredible, and there have been some really great fans there through the generations,” Hanson said. “To have Johnstown lose hockey, at least from my perspective since I have such a sweet spot in my heart for the city, was so tough. It’s awesome to see hockey back there and doing well. I talked to a lot of fans and they think it’s great. The Tomahawks have stressed community relations. 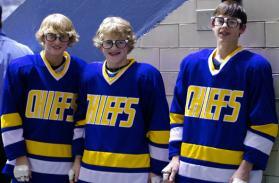 They are eager to write their own chapter of Johnstown hockey history. It hasn’t taken much to convince the players. “Everyone in the locker room is a good person and the personality has to fit in. Guys are more than willing to spend time in hospitals and schools. They are giving back to fans as much as the fans give to the players,” Boyd said. The first Johnstown native to play for the Tomahawks is Cody Boyd, Rick Boyd’s son. He grew up in Johnstown and spent last season playing for the NAHL’s Bismarck Bobcats. He’s thrilled to be part of what the Tomahawks are doing on and off the ice. “We’re all fighting for our future. Everybody is fighting to go to college. I think everybody on our team is definitely good enough to make it to that level,” he said. “This is the best group of guys I have ever played with. We all work for each other and the community. Right back where they started from. Joe Sager is a freelance writer based out of Pittsburgh.